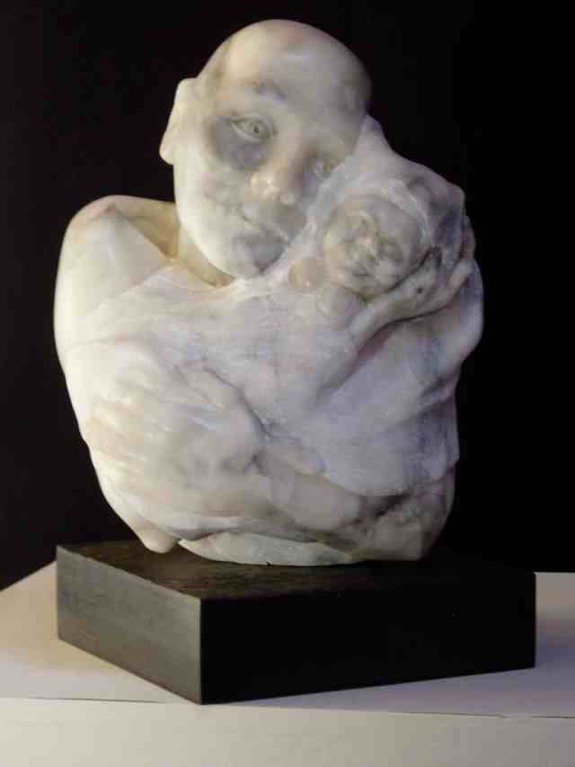 I design and make fine art sculpture, mainly in stone. It is important to me that I do everything myself, from the first idea to the finished work. Fine art sculpture is easy, you just remove the stone you don’t want and leave the stone you do want. My most abstract works are usually figurative in origin, reflecting my interest and delight in the human condition. I have many, many heroes, but perhaps the ones who excite me most are Donatello from the Renaissance era, and Isamu Noguchi from the modern era. The former because he changed sculpture from an artisan's to an artists work, and the latter for his spanning of two cultures, and making groundbreaking works in both. I try to explain the aim of my work by saying I am ’giving a shape to feelings'. I have public works in Aberdeen, for example the Ruthrieston Stone, a standing stone with incised figures from the ancient Pictish culture, and ‘Form I’ at Woodend Hospital, a modern work dedicated to the surgeon who saved my life in 1990. I have worked with ‘Whitespace’ the Aberdeen’s Council’s Community Arts Development section at Northfield, helping local children on various sculptural projects, and at the Cordyce School in Dyce. Keith Mellard B.A. (Hons), H.N.D., H.N.C. (Fine Art). I was born and raised in the West Riding of Yorkshire, and grew up with the rich local tradition in the art of sculpture which included both Barbara Hepworth and Henry Moore. Studying the fine arts has been a lifetime pre-occupation, and continues to this day. After studying painting in Aberdeen for some years, I decided that this was not the way forward for me, and I eventually settled on sculpture, which used what I had learned to the maximum degree. Artists owe a debt to craftsmanship, and for me the process must include all parts of the work, from design to finished artefact. Otherwise an evolution that often happens during the making, cannot happen, and the artist becomes just another client. Thornes House Grammar School, Wakefield. No.1 School of Technical Training, R.A.F Halton. B.A. (Hons). (1990) University of York. Furniture designer, maker and woodcarver. Work shown at the Great Yorkshire Show, Harrogate. Lifelong art and sculpture studies and practice, which continue. Aberdeen for over 20 years. As a member of the Bahá'í Faith, I try to walk the spiritual path with practical feet. Alabaster, Cararra marble, Sicilian marble, Ancaster stone, Hoptonwood stone, Portland stone, Caithness stone, Moray (Clashach) and Yorkshire sandstone. Steel and Ferro-concrete and Bronze casting. To quote a hero, Barbara Hepworth “... ... to give shape to feelings”. To try to say some things I think need saying. To solve the problems any piece of stone offers. These problems are opportunities for the evolution of a piece. It is material music with a profound rhythm, it satisfies. Sometimes the material tells me what to do, sometimes my idea becomes the material. The best times are when the material informs the idea and all is rhythm and music. Lost Gallery, Strathdon:- where my work is on show and for sale. Aberdeen Artists Society:- annual exhibition, Aberdeen Art Gallery 2007, 2008, 2009, 2010, 2011 and 2012. Coast Art Festival:- Long Gallery, Duff House, Banff, June 2010. Fabric of the Land:- Geology and Petroleum Geology Department, University of Aberdeen, 27th August to 18th September, 2011and 2012. North East Open Studios (NEOS):- 2007, 2008, 2009, 2010, 2011 and 2012. Scottish Sculpture Workshop:- 'The Lost Hand', - demonstration of stone carving, 11th and 18th Sept, 2011. In 2012, I was involved in a communal project called 'Maker's Meal' at the Workshop, where a group of artists was assembled by the director, Dr. Nuno Scramento, to design and make pottery, tables, cutlery and food for a meal. Alcuin College, University of York. Was installed in the College and unveiled by the Lord and Lady Mayoress of York, Keith and Karen Hyman. June 2012. The Ruthrieston Stone, a standing stone with Pictish figures, for Ruthrieston Residents Association. The sculpture was unveiled by Lord Provost Peter Stephen of Aberdeen on 24th October 2008. The piece is in the pocket park adjacent to South Anderson Drive, andobtained a Merit in the Beautiful Scotland Neighbourhood Awards. The work was done in consultation with the Chairman, Gregor McAbery, and association members. Photographs included.